Horseradish sauce with beets is a dazzler! If you want to bring some hot, zingy excitement to the dinner table, look no further!! 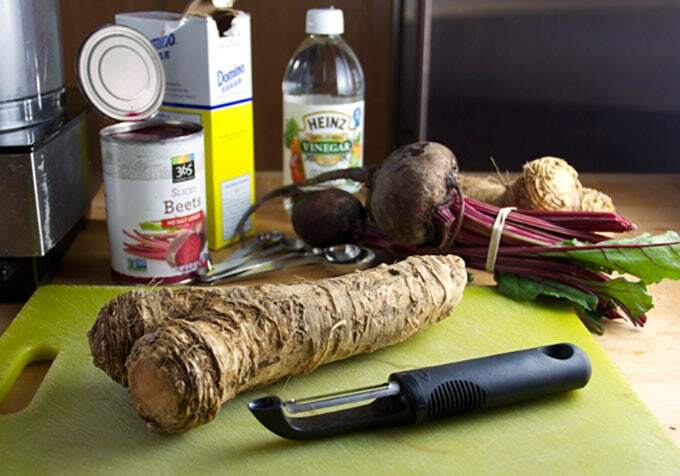 All you need is 15 minutes, a horseradish root, a can of beets, some vinegar, salt and sugar. 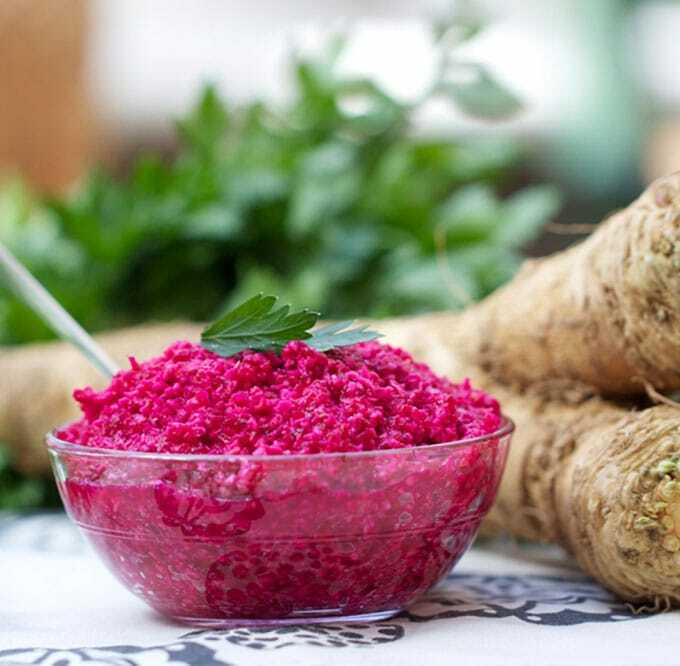 Fresh horseradish sauce with beets is an explosion of color and flavor. It is a perfect accompaniment to roasted or braised meat, and baked or smoked fish. You haven’t really tasted horseradish if you haven’t had it fresh from the root. And I’m not just saying that because I like it better (which I do). There’s a scientific explanation as to why fresh horseradish is not the same as the stuff you buy in a bottle. Horseradish is a plant with some interesting qualities. It’s a root vegetable from the same family as mustard, wasabi, broccoli and cabbage. When unpeeled it appears like any other root, with no particular smell. But when you peel it, stand back or prepare to cry! Horseradish undergoes a chemical transformation when its flesh is broken. The cutting activates enzymes and causes the formation of mustard oil which transforms horseradish from an odorless, ordinary-seeming root, into something that can clear your sinuses! Seriously, when you grate the horseradish in your food processor for this horseradish sauce recipe, close your eyes, hold your nose, and take the top off with caution. It’s very strong. Grated horseradish mixed with vinegar is know as “prepared horseradish.” Vinegar must be added to slow the enzymes and stabilize the horseradish after it’s grated. For this recipe, in addition to vinegar, we add cooked beets and a little sugar, salt and pepper. By the way, if you don’t add vinegar to grated horseradish, the enzymes will continue to act and the horseradish will slowly get more and more bitter and will eventually turn brown. Prepared horseradish is best consumed fresh because the horseradish will slowly lose its pungency over time. Grate the horseradish in your food processor with the grating blade attachment. Add vinegar, canned beets, sugar, salt and pepper. 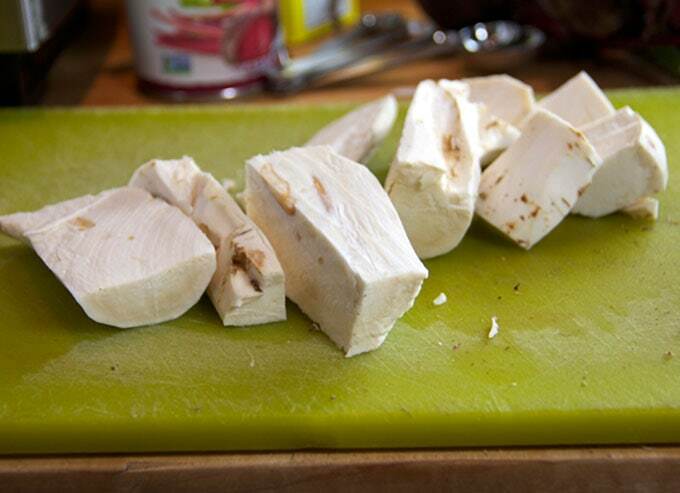 Roughly chop everything in your food processor using the multipurpose chopping blade. Store the horseradish sauce in a tightly sealed container in the fridge. Horseradish sauce will keep in the fridge for a day or two but for maximum flavor and zing, eat it within three hours after you prepare it. Centuries ago horseradish was believed to have medicinal powers that help the body clear mucous. I am quite sure that it does, based on the few times I got too close to the food processor when I lifted the cover. Plus, it clears my sinuses every time I take a bite. According to some current day sources, horseradish root has healing powers. Horseradish is fat free and low in calories and sodium. Many types of horseradish sauce add mayonnaise but not this one. This horseradish sauce is healthy! At the Passover seder hot pink horseradish is delicious on matzo and gefilte fish and brisket. But it also has a symbolic importance. The bite of fresh horseradish sauce is a reminder of the harsh bitterness of the Jews’ lives as slaves in Egypt. Fresh horseradish sauce with beets is commonly served at Easter dinner in parts of Eastern and central Europe, as an accompaniment for lamb. 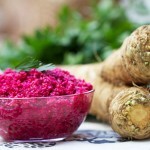 Here’s the recipe for Fresh Horseradish Sauce with Beets. If you try this recipe I hope you’ll come back to leave a star rating and a comment. I’d love to know what you think! Hot and zesty condiment for fish, beef or lamb. Or add delicious zing to a sandwich. 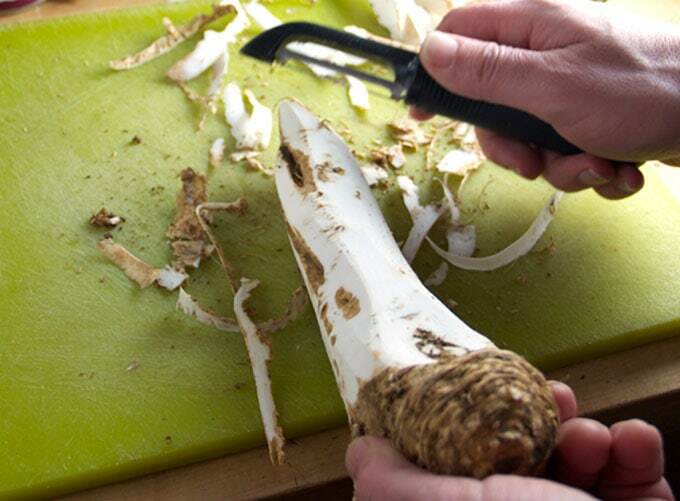 Using about 4 inches of the peeled horseradish root, cut it into chunks that will fit into the feeding tube of your food processor. Use the shredding blade to shred the horseradish. 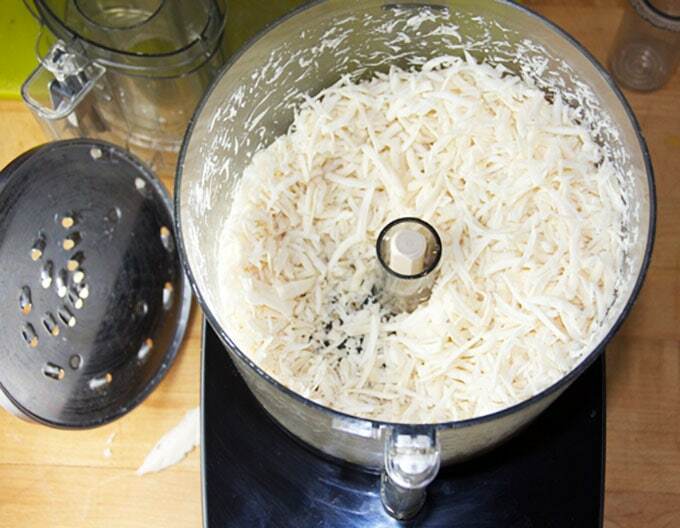 Take out the shredded horseradish and switch to the chopping blade. Return horseradish and all the rest of the ingredients to the bowl of the food processor. Pulse several times, scraping down the sides, if need be. Process for 30 second or so, or until you get a nice finely-textured consistency. Enjoy! NOTE: Horseradish sauce will keep in a tightly-sealed container in the fridge for 3 days but it will lose heat over time. If you like it hot and zingy, eat it within a few hours after you prepare it. WARNING: do not breathe in too close to freshly grated horseradish, as it is blindingly hot. Also, start with a very tiny bit when you first taste it to ensure you know what you are in for. This looks so good! Your photos are really beautifully done, too. Great job and thanks for sharing! 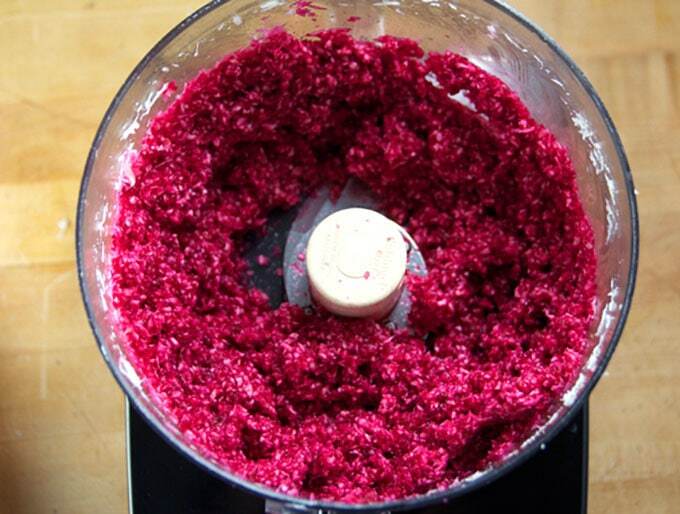 How to do cut the sharpness of beet horseradish. Mine is way too hot!!!! Oh no! sorry it’s too hot for you. It tends to be very hot but in a good way, if you like that kind of thing. It’s not the kind of thing you ever want to take a big spoon of – rather just put a bit on some bite of food and enjoy the zestiness of it. it always loses some of its heat over time so if you wait until tomorrow it will be much less hot. 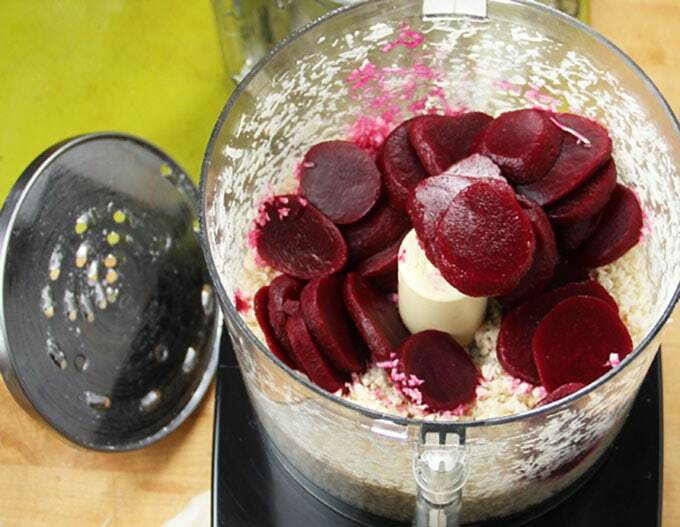 Also, you can dilute it with more beets if you have more – the more beets you add, the less hot it will be. I hope this helps. QUESTION: I have been making my own horseradish for years, but usually using non cooked beets ..the other day I was making the horseradish for Passover, Friday This time I cooked the beets. I think it is awful and it has no taste. I put some apple cider vinegar, salt and sugar into it. We like it very strong..HELP!!! What can I do to make it stronger? Buying more fresh horseradish is out of the question as it is not sold in my area. I traveled over an hour to get it. called Atomic Horseradish – that sounds like it could do the trick! Keep me posted. On Easter Sunday (Niedziela Wielkanocna) Polish families celebrate their traditional Easter breakfast and eat all the food that was blessed the day before. The most common Easter food includes: coloured eggs,rye bread, ham, sausages, horseradish, ćwikła (horseradish mixed with beetroot) and żur (sour rye soup). Am making it on Saturday morning. Any way to can this so it keeps longer. Very expensive to buy here in Switzerland as it is imported from the US. It is also not as strong as the one available in England, but it would be a crime eating chicken without it. Am going to give this recipe a try. Great! let me know how you like it!! Hi Joel, I’m so glad you discovered the joy of freshly ground horseradish for Passover. It’s one of my favorite things on the Seder table! Happy Passover to you and Ellen and family. This would be so delicious with Easter lamb! The gorgeous color on this is amazing Lisa. Lauren, I make it for seder every year. It’s pretty zingy but everyone loves it! It jazzes up matzo and brisket like nothing else. 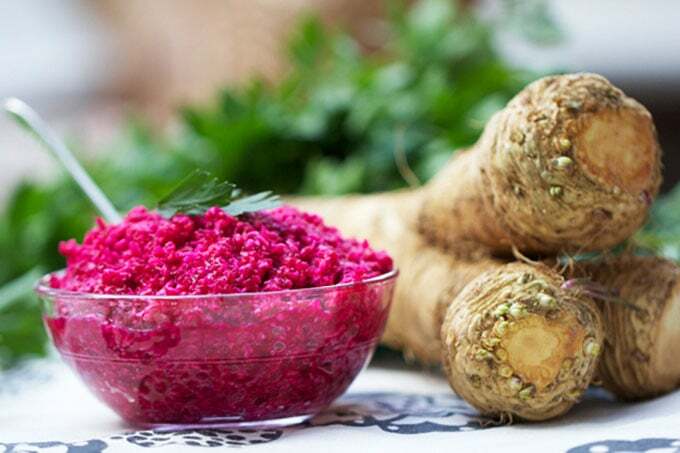 Horseradish is most potent right after it’s grated so it will get a bit tamer over time or you can add extra beets if you want to make it milder. A long time favorite for my family…we have a spoonful on our Easter Eggs And Kielbasa! Thanks for sharing…making it now! I live in Dubai and always bring home beets and horse radish from home (Canada). This year I didnt as thought I had enough in the fridge. I came back to dubai, looked in the fridge and it had been thrown out. I was crushed…for real! Going to try this recipe….can’t wait! Just in time for Passover, the best I ever tasted! hansk! I found you from your like of EasyRecipe. I’ve learned more about horseradish in 5 minutes than I had anywhere else. I love beets (or beetroot as they’re called here in Australia) and I want to make this this. The color is striking.